We have a talented and passionate team of yoga teachers ready to take you to the next stage of your yoga practice. Find out more about them here. I turned to yoga to help me find sanity in the chaos of a young family (which included a travelling husband and three kids under two!) I desperately needed something to get my body moving and find my way through the brain fog! Yoga was also a natural progression from my dancing background, where I taught children and adults for nearly 20 years. My yoga practice has enabled me to indulge my interest in mindful movement as therapy to help us live the best life we can. What can we expect in your seriously awesome yoga classes? In each of my classes, I aim to create a space that helps you remember how you want to live your life. I will guide you out of your head and back into your body using healthy movement, attention to breath, and present moment awareness. I hope you will discover a newfound freedom of body and mind to get out and start kicking those goals! Why do you like this yoga thing anyway? It has changed my life, inside and out! Not only is my body moving the best it ever has, I have cultivated a clearer sense of who I am, what is important to me in this life, and a deeper trust in my capacity to deal with life’s complexities. So come and roll your mat out with me - I am ready when you are! I’m a health professional who unexpectedly fell in love with yoga. I held senior public health roles in mental health, cancer, stroke and chronic illness, but traded up a focus on evidence, research and evaluation to teach yoga. Now, I encourage my students to run the yoga experiment in their own body and mind, with a sample size of one, and richly reap the rewards of their own personal research program. What can we expect in your seriously awesome classes? Expect a nurturing, light-hearted and creative yoga class. While we move and breathe together on the mat, I want you to forget your 'to do' list and focus on your own body. And I’ll do this by tapping into the wealth of knowledge I’ve gained studying with great contemporary yoga teachers, to help you find a practice that works perfectly for you. Life throws us all kinds of challenges. While we can’t control the complications that present themselves, we can control how we deal with and react to these situations. Yoga has given me the tools to cope infinitely better. And - as an added bonus - I’m not quite as clumsy as I used to be (in fact, sometimes I have the occasional moment of grace). I’m a secret superhero. Don’t tell anyone okay! Functional movement patterns that stimulate the mind-body connection. Let’s explore this mindful practice together. Did I mention the secret superhero thing? Yoga keeps me flexible enough to jump over tall buildings & strong enough to knock out baddies with one whack. I once believed that hard work was the answer to success. Yoga has taught me that this is not necessarily the case, sometimes being open to hear the subtle messages of the mind and body can reveal a path of true happiness. I remember my first ever yoga class, 10 years ago. I hid up the very back where I thought nobody could see me (classic first timer assumption, as we all find out, there is no hiding once the class comes into downward dog). During the class my friend and I were knocking each other with our limbs as we repeatedly got our lefts and rights confused. This set us off into fits of giggles. Despite how uncoordinated we both felt, there was no denying this amazing calm, blissed out post yoga goodness we experienced afterwards. I knew then, that there must be more to yoga then just the impressive looking shapes. I continued to practice yoga and explored the benefits of applying yoga philosophy in to my life. Over time this passion fueled an urge to go to the source, Rishikesh, India. Here in I took my love for yoga one step further and studied to be a teacher of yoga. I will share with you what I have learned about the about the connection, about the compassion, about the awareness that yoga can bring every day. I will encourage you to take a joyful approach to yoga and we’ll explore how to move with fluidity and presence throughout the class. You’ll leave feeling calm and relaxed, like you have given yourself a beautiful gift. Along with my work as a Massage Therapist and Reiki Practitioner, teaching yoga gives me such an amazing opportunity to watch and encourage others during their own personal journeys of growth and discovery. Every class, whether I’m teaching or practicing, is such a rewarding experience. I am the universe. Yes that sounds hippy, but it’s the truth, scientifically speaking because we’re all made of the same energy! In physical form though, I’m a yogi, environmental scientist, author and speaker. I’m a doctor - but not the cool ‘ER’ George Clooney kind, more the nerdy ‘Big Bang Theory’ Leonard Hofstadter kind. I’m also an outdoor adventure climb-a-mountain kind of person. I’m a wife to an overly adventurous outdoor man, and mother to our Aussie shepherd Bear (named after ‘Bear’ Grylls – who else?) I’m a globe-trotter; India will always be my spiritual home but the rivers and forests of Melbourne are my soul centre. I am unapologetic about my gluttonous chai consumption – I am not responsible for my actions if you leave chai around me unattended. You have been warned! My classes invite you to find your edge, get playful and tap into your hidden power. I invite you to reconnect to your true self and the world around you, so that you can learn to live a life that is centred, empowered and free. My nerdy love of science means that I pour over the latest yoga anatomy and physiology research, so my classes always cater to your very individual body and mind to safely build some serious strength and flexibility. My classes offer you an empowering and nurturing space where you can learn to be of better service to your true self, and to the world. How long have you got? I love yoga because it feels like coming home. I’ve learned about acceptance and non-judgement, starting with myself. Yoga is community. And friendship. It is my way of stopping and reconnecting with my self, with those around me, with the planet and the universe. Of finding and reconnecting to my purpose in the world. Yoga is my go-to work out. And yes its pretty fun falling over trying to learn to hold a handstand on a sweat-soaked mat. And its so very helpful to have a way of calming my craziness down - because, my goodness, it needs a lot of calming! I'm a career marketer with a love of all things yoga. After my first class in London a few years ago, I quickly became hooked. I signed up for yoga teacher training because I wanted to share what I love about the practice with others. When I’m not doing yoga I like to travel, listen to music, read and hang out with my cats! You’ll often find me standup paddle boarding. I love the peace and tranquility being out on the water with nature. It mirrors what I feel on my yoga mat. Yin yoga is my thing, my passion. It’s different to traditional yoga as you let go of muscular effort to slowly unwind fascia, the connective tissue that holds us all together. This takes time, but allows for deep profound change. Time spent holding the pose allows you to observe the mind. Gradually, gently, eventually you can let go of what you no longer need. I've studied with some of the world's leading yin yoga teachers and I blend what I’ve learned from them with what I’ve learned through my own practice to my classes. Expect to leave my classes feeling refreshed and ready to face the world. I love the physical side of yoga and the ease and wellbeing that I feel after practicing postures but I also love that while on the mat I often gain deep insights about myself. It’s the philosophical side of yoga that draws me to my mat every day. I have learned that well as improving strength and being better at dealing with stress, yoga has given me the tools to develop happiness and self-awareness. I’m now kinder to myself and others. I've met some absolutely amazing people on my yoga path and have become better acquainted with myself on the journey. I have been many things over the course of my life; a daydreamer, adrenaline junkie, artist, animal lover, writer, wanderer, yogini and in most recent years my most significant role yet – a mother. My yoga love story started a decade ago when the universe presented me with one very important question; re-evaluate the way I was living, or burn out. Fortunately, I chose the former and yoga has played a pivotal role in shaping the path my life has taken. I have spent the last ten years exploring the vast landscape of this ancient practice, along with my passions for anatomy, physiology and psychology and … the romance continues to blossom to this very day. I love that yoga has the power to both relieve and nourish us all at the same time. I love that it gives us a chance to be playful and curious, but can also invite us to be serene and introspective - and that is exactly what I encourage my students to explore in all of my classes. Expect an inclusive, organic, balanced practice that connects you from the inside out, and outside in. Because it gives me the chance to ‘reset’ every single time I practice. Through yoga I found respect for a body I was disconnected with for most of my life. I discovered how to breathe in the truest sense of the word. My practice allowed me to explore the complete panorama of my mind, body and spirit, which continues to be an enriching and amazing journey. Through life’s highs and lows, yoga is my safe place to land, and it is with great joy that I know my practice will continue to evolve and shape me until the end of time. I'm an earlybird (first out of bed and firstborn), an elephant (I don't often forget) and have expected the unexpected (twins didn't run in my family but they do now). I've down dogged as a teenager, as a corporate marketer, with babies on board and in the world, as a student (still) and as a teacher. I am amazed by our bodies in all their shapes and variations. Expect to play with what's possible, to explore sensation and to find space. Let’s find out what happens when you’re all in - absorbed in your breath and your body. Yoga... just thinking it feels like a big breath out. Yoga is when I get un-busy, it's where I reboot, it's a quietness and a sense of space for me. Bare feet on boards, Sanskrit sounds, that first deeper breath as you move out of Savasana... it's the little things too. I began my yogic journey 10 years ago exploring Hatha and Bikram yoga lineages with a regular practice. Two beautiful children later and a long successful career in Marketing and Event Management, I found myself yearning for the sense of serenity and peace that a yoga practice afforded me. After much contemplation, I found the courage to complete studies in both Hatha and Yin Yoga giving me the ability to share what I adore so much with others. My practice and knowledge continues to expand as a self-confessed devotee of yoga workshops, literature and playdates with my yoga pals. The word ‘yoga’ means ‘union’ and ‘union with the divine’. With this meaning permanently etched in my heart, Yoga has become my playground. My intent is to create an environment that gives us time to share in a contemplative practice using breath and meditation, physical expression through asana, and nourishment with relaxation. Enjoy in the sense of community with other like-minded yogis, from novice to the advanced. Let’s play! Who wouldn’t rather don fancy patterned active wear and bare feet as their daily uniform over a stuffy suit and a pair of high heels (Christian Louboutin exempt of course)? Yoga gives me the ability to feel bendy, stretchy and softly, softly. What does that mean? Come and do one of my classes and you’ll find out! I played around with Yoga as a child in the 70s, when my mum was going to classes. Back when everyone wore leotards..... I explored yoga living in Varanasi India in the early 90s, but it was not the yoga that you see commonly practiced these days in the West. I returned to it after a long history of anxiety and depression. Yoga helped ground me. I felt my body and stopped listening to the noise in my head. The breathing, the meditation, the movement were all a part of my recovery. Now I’m hooked on exploring modern yoga as well as the ancient roots. It takes me all over the world to study with my teachers! I like to practice gentle movement and Yin at home with my cat attacking me and my husband joining in. It’s a bit of a fusion of east meets west! I love biomechanics and modern movement exploration so there are sometimes new versions of traditional asana as well as new and creative asanas. I enjoy incorporating strength and mobility practices and love using a variety of props to enhance the practice. Sometimes my yoga doesn’t look like yoga! My Yin style is influenced by my teacher Sarah Powers, so there will be elements of self enquiry, Breath work and moving Qi (chi or Prana). I teach in a very relaxed way and keep the practice gentle, sweet and delicious giving you the time to unwind and find ease. There are so many elements to yoga so that I’m continually studying and learning. I’m a yoga nerd! I love sharing new and exciting ideas with my students and the yoga world has endless opportunities to learn, grow, move, relax, change, chill, sweat, reflect, laugh, cry, and travel. On any day I might use an element of yoga to de stress, centre myself or to move and release. It’s a great body practice, a wonderful mind practice and a great practice for the spirit. I’m a trained naturopath, kids yoga teacher, mindfulness advocate, writer, food blogger and, most importantly, a devoted mummy. People often say that their profession does not define them. For me, what I do is exactly what I love – it’s what defines me. My favourite colour is orange. Why? It signifies creativity, fun, strength, vitality and transformation – all the qualities that are important in life! I describe my class using all the positive words that you would use to describe your child: full of life, fun, social, nurturing, optimistic, adventure-seeking, curious, open-minded, friendly and welcoming. It’s these beautiful qualities our children possess that we wish we held onto a little stronger as adults. That is the essence of my class. Mixing music and games with mindfulness exercises and coordinated activities is the best way to make yoga enjoyable for kids. There are specific exercises to help them strengthen their backs and growing muscles, and exercises to help them relieve tension. We will practise breathing exercises, deep relaxation and meditation – invaluable skills that will see your child have the best possible experience through school, sports, friendship and life in general. Until you try it, you cannot describe it. Once you try it, you still may not be able to describe it. It’s a feeling that cannot be explained – pure elation, connectedness, peace and contentment. And that’s why I love it! Yoga has helped me become calmer, clearer, fitter and stronger. It fuels all areas of my life and enables me to make better decisions, to organise my time more wisely, to be a better mother, a more patient friend and a more empowered woman. It’s a gift to know that I can help others reach this feeling. Yoga makes me feel amazing. And everyone deserves to feel amazing! I’m an occupational therapist by trade and blend my health professional background with my passion for a holistic approach to wellbeing, working as a life coach, self-love and mindfulness mentor. After being seriously burnt out working in the hospital setting several years ago, I turned to meditation and yoga. What I found on the other side was simply life changing! What can we expect in your seriously awesome meditation classes? Expect a cosy sanctuary away from the chaos of everyday life. I'll guide you through a variety of meditation styles, facilitate insightful discussion on applying mindfulness to your day to day and help you achieve greater inner peace, presence and connection. I encourage people of all levels of experience to come along and simply be, to leave your worries and to-do lists behind and experience the many benefits of meditation. Why do you like this meditation thing anyway? My interest in meditation and mindfulness began 20 years ago when studying as an occupational therapist. Whilst exploring the negative impact of stress on the body as well as the benefit of the breath and the relaxation response to restore the body to a state of optimal wellbeing, I became fascinated with this powerful practice. While I still experience the regular stressors of daily life like most people, I'm able to navigate them with a much greater sense of trust and calm. I've also witnessed the magic of meditation and mindfulness first hand with my coaching clients in overcoming anxiety, stress and overwhelm. Come and experience the magic for yourself! I started practicing Hatha Yoga when I was 15 years old alongside my mother in one of the very few schools at the time. Even at such a young age it fascinated me that working with the body outwardly could have an effect on the organs inside the body. There was no music, just a bit of story telling and philosophy. I practiced Iyengar Yoga in my 20s and always marvelled at my instructor and her strength, knowledge, and self-discipline. My core and spine were never in better health and it saw me to the end of my first pregnancy. Following a long period of stress, coupled with chronic anxiety I found my way back to Yoga. I once again fell in love with its beautiful age-old teachings. After all, it is through Yoga that we begin to discover that we really are all the same. We are from the same source of energy & consciousness and we all want similar things: to love, be loved, to be happy, safe and free. After spending time in India at The International Yoga Festival and experiencing so many of the different forms of yoga, it opened my eyes to the fact that Yoga is not just about “Asana” or postures. Yoga can be very accessible to all ages and abilities. I like to weave some of these under-utilised and much needed pearls of thousand-year-old wisdom into my classes. Expect to acquire an authentic set of tools to breathe, be present, pause, reflect, relax, and come home to your true self while developing self-awareness, peace and acceptance through these ancient practices. Why do you like this Yoga thing anyway ? I love the magic behind Yoga, its benefits are seen and unseen. It’s mystical teachings work through the layers we don’t see, and then they ripple out into our lives. The changes manifest in the way you start to live your life off the mat. My experience has been that of living more authentically, being kinder to myself and developing healthier patterns of living. Mindfulness and gratitude also become so well practiced they are part of my everyday family life. I first discovered yoga when living in London many years ago. I was very fortunate to find an incredibly inspiring teacher who laid the foundations of what was to become a very important part of my life. Yoga gave me a sense of peace and inner wisdom. I knew it was something that would stay and grow with me…and it has. I have a background in teaching dance and movement to children and teens for 15 years, which comes through in my classes. I also like to make them fun and challenging with a focus on relaxation and meditation. I have always been interested in the mind-body connection and yoga has a lovely way of bring the two together. With a background in environmental sustainability, economic development and social justice, I am currently working between Melbourne and Oxford University where I studied Sanskrit, and Hindu and Buddhist spirituality as part of a Masters in Classical Indian Religion. When I am in Australia you will see me on the yoga class timetable teaching covers and running workshops on Indian philosophy. I like to bring a sense of expansive spaciousness to my classes - a strong flow, an empowering energy and an experience of possibility where students might find themselves reaching beyond what they thought were their limitations both on and off the mat. Yoga has made an incredible difference in my life. I can do things now that I couldn't do ...well ever really! Yoga isn't about just improving strength, flexibility, concentration, and general wellbeing - though of course it does all that. Yoga is a way of life that weaves together our mental, physical and spiritual dimensions, opening us up to possibilities we never imagined. Yoshiko began her yoga journey in 2006 and since then yoga has been a part of her life. From a tool of self-enquiry to a means of expression, she has been fascinated with the meditative state body movement can bring to the mind. 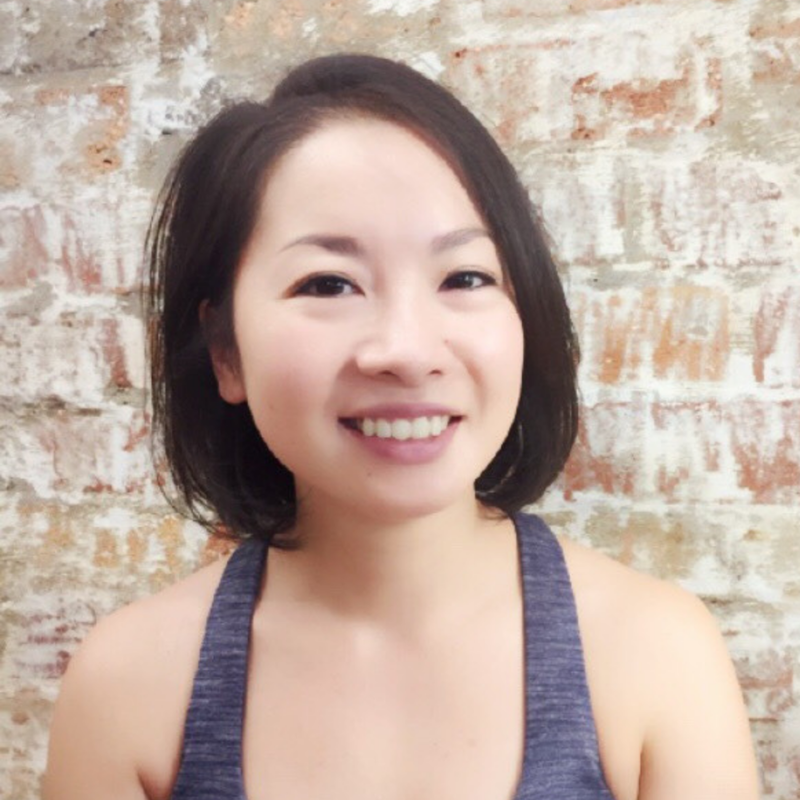 As a devoted yoga practitioner and facilitator, Yoshi puts emphasis on safe alignment, graceful sequences and mind-body connection. Off the mat she is a lover of coffee, travelling, movement, everything underwater (scuba diving, snorkelling, aquariums), and anything wellness and beauty! Expect a connection of flowing movements, which allows you to explore and challenge your body while developing a fluid practice of your own. I invite you to honour your body and sense into what it needs and notice how it would like to be moved. And perhaps find yourself moving without thinking, in a meditative state. Yoga is a place for me to come back to; with enquiries, for grounding, centering to self. Pretty much an essential tool to dance this thing called life! My journey started out with the physical aspect that yoga movement brings and then started to notice the benefit it brought to my mind, my soul and the change it brought to my relations to the world. It has been an continuum of noticing, realisation of self and the joy it brings.